In evaluating a patient with a possible medial wall fracture of the orbit, certain key points need to be elicited on history, especially since early symptoms may be minimal. First, take a detailed history about the trauma. This should include the specific mechanism of trauma and when it occurred. A history of trauma from several years prior also could be significant. Any events associated with the actual trauma, such as loss of vision or loss of consciousness, need to be elicited. Also inquire about events since the recent trauma, such as nose blowing. Current symptoms, such as any change in vision or diplopia, should be elicited. Although quite rare, a history of epistaxis and cerebrospinal fluid (CSF) rhinorrhea also should be elicited. The incidence of isolated fractures of the medial orbital wall in the literature varies considerably. However, the incidence has increased in recent years because of a rise in the incidence of high-energy impact orbital injuries, coupled with improved radiographic diagnostic procedure of the orbital structure. Although data indicate that isolated medial wall fractures are not frequent, concomitant medial wall and floor fractures are more frequent. Although medial wall fractures are known to occur in multiple races, de Silva and Rose reported an increased incidence of isolated medial wall fractures in Afro-Caribbean patients compared with white patients or those of Asian descent. They postulate that this disparity results from a thicker orbital floor in Afro-Caribbean patients than in those of other races. In white and Asian patients, isolated orbital fractures were more common in the floor than in the medial wall. This 55-year-old man sustained an injury to his right orbit as a result of blunt trauma from a fist; shown in primary position. When the fracture occurs as a result of a direct injury, it is usually in conjunction with a naso-orbital fracture, which results from direct application of blunt force to the naso-orbital area. The most frequent cause of these naso-orbital fractures is a motor vehicle accident that results in the face impacting against the steering wheel or dashboard; additional causes include blunt trauma from the fist or the elbow. Medial wall blowout fractures are potential sequelae of blunt periorbital trauma. Common causes for this type of medial wall fracture include fists, elbows, shoe kicks, baseballs, and tennis balls, all of which have a diameter greater than the orbital rim. A naso-orbital fracture tends to consist of a comminuted, depressed fracture involving the nasal bones, ethmoid sinuses, and medial orbital walls. It occurs when a blow of sufficient force is applied to the nasal bridge area. Such blunt trauma can cause the medial wall to develop a fracture in 1 of 2 ways. First, when the nasal bone fragments are projected backward, the thin lacrimal bone and lamina papyracea are comminuted easily. The nasal bone and frontal process of the maxilla may be displaced posteriorly into the ethmoid sinus; as a result, an in-fracturing of the medial orbital wall into the orbit occurs. Therefore, the compressive force causing nasal fractures is a very important causative factor of pure medial wall fractures. With blowout fractures, the medial wall is fractured indirectly. When an external force is applied to the orbital cavity from an object whose diameter is larger than that of the orbit, the orbital contents are retropulsed and compressed. The consequent sudden rise in intraorbital pressure is transmitted to the walls of the orbit, which ultimately leads to fractures of the thin medial wall and/or orbital floor. Theoretically, this mechanism should lead to more fractures of the medial wall than the floor, since the medial wall is slightly thinner (0.25 mm vs 0.50 mm). However, pure blowout fractures most frequently involve the orbital floor. This may be attributed to the honeycomb structure of the numerous bony septa of the ethmoid sinuses, which support the lamina papyracea, thus allowing it to withstand the sudden rise in intraorbital hydraulic pressure better than the orbital floor. Medial wall fractures frequently remain undetected, either because the clinical signs and symptoms of such a fracture may be masked by extensive periorbital trauma or because they give clinical symptoms in only a few instances. Therefore, a thorough clinical examination is critical to suspecting this type of fracture. Fractures of the medial orbital wall can result in various clinical presentations. The different clinical syndromes depend in large part on whether the fracture is caused by a blowout injury or whether it is part of an ethmoid-orbital fracture. Clinical findings suggestive of a medial wall fracture include periorbital edema and ecchymosis, (nasal) subconjunctival hemorrhage (all nonspecific), subcutaneous emphysema, epistaxis, CSF rhinorrhea, narrowing of the palpebral fissure with forced lateral duction, restriction of abduction, limitation of adduction, the acquired retraction syndrome or retraction of the globe on attempted abduction or adduction, horizontal diplopia, and progressive enophthalmos. Medial wall fractures also tend to be commonly associated with nasal fractures. The most striking features of an isolated medial wall fracture are diplopia on medial and lateral gaze and/or enophthalmos. Patient with an injury to his right orbit as a result of blunt trauma from a fist in right gaze, showing full abduction of the right eye. Patient with an injury to his right orbit as a result of blunt trauma from a fist in left gaze, showing poor adduction of the right eye. Blowout fractures and naso-orbital fractures of the medial wall can be associated with limitation of ocular motility. Medial rectus muscle incarceration is described more frequently in medial wall blowout fractures than in naso-orbital fractures. [5, 6] Medial orbital fractures with true incarceration of the medial rectus muscle are rare. However, diagnosis of a medial wall fracture is often suggested by medial rectus entrapment. Patients with restriction of the medial rectus muscle and/or its surrounding connective tissue may present with horizontal diplopia, pain on abduction, restriction of abduction and adduction, and horizontal limitation with the forced duction test. This specific presentation with severe tissue entrapment is more common in children who sustain blunt trauma to the orbit. This is because blowout fractures in the pediatric age group tend to be trapdoor-type fractures. The orbital bones in a child's orbit are hypothesized to be more flexible than an adult's bones. Therefore, rather than buckling and breaking in pieces like the brittle adult bones and leading to tissue prolapse, the child's bones tend to return to their original position and, in the process, entrap surrounding soft tissue. Other associated features of these pediatric fractures include nausea, vomiting, dizziness, and lightheadedness due to a vasovagal response; pain with eye movement;  and minimal external evidence of trauma despite marked motility restriction; therefore, the lack of ecchymosis or edema, which are common soft-tissue signs in orbital trauma, should not deter the clinician from suspecting a serious injury. The symptoms associated with increased vagal tone that stem from the oculocardiac reflex complicate examination in children; therefore, clinicians need to maintain a high index of suspicion and proceed to appropriate orbital imaging in these situations, as these symptoms can sometimes be mistaken for an intracranial injury rather than an orbital injury. Double vision may exist in extremes of gaze only, if orbital congestion is excessive. An important test to determine whether a muscle is entrapped is forced ductions. Restriction on forced ductions usually distinguishes entrapment of orbital contents from a contusion of the extraocular muscle, a lesion of the nerve, or simple congestion of the orbit. However, early on, if a muscle is swollen, it may be difficult to differentiate the swelling from true entrapment. A pseudo–Duane retraction syndrome or retraction of the globe and narrowing of the palpebral fissure upon attempted abduction may occur with medial wall fracture associated with medial rectus entrapment, and it is pathognomonic for this complication. Other signs that should raise the suspicion of a medial wall fracture in orbital trauma are epistaxis, orbital emphysema, and CSF rhinorrhea. These signs occur less frequently than motility disturbances. Be alert for CSF rhinorrhea because it represents injury to the layers enveloping the brain and, thus, is an indication for prophylactic broad-spectrum antibiotics and neurosurgical consultation. 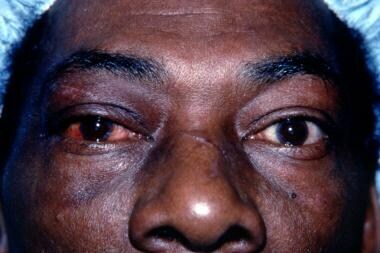 Epistaxis may occur either in isolated medial wall fractures or in conjunction with naso-orbital fractures. Orbital emphysema is the result of a communication between the ethmoid cells and the orbital cavity. To produce this emphysema, the air pressure in the ethmoid cells should be very high, which is not produced easily because of the drainage of air into the nasal cavity. Therefore, orbital emphysema may occur when there is simultaneous injury of the naso-ethmoid-frontal area, a precondition of nasal obstruction, blowing of the nose after the injury, or Valsalva maneuver after injury, such as sneezing. Severe orbital emphysema can lead to severe, though reversible, visual loss from the extremely high intraorbital pressure. Careful palpation of the periorbital soft tissues should always be performed to look for crepitus, which is a helpful diagnostic sign of orbital emphysema; however, it may not be present when proptotic orbital tissue is very inflated and eyelids are tense. The clinical picture of severe orbital emphysema may simulate a large orbital hemorrhage, which may occur with medial wall fracture if there is trauma to the ethmoidal vessels. The hemorrhage also may cause severe visual loss due to compression on the optic nerve. It is critical that this acute compartment syndrome with rapidly progressive proptosis and elevated IOP due to orbital hemorrhage be distinguished from muscle entrapment as the cause of globe restriction in all age groups. Medial wall fractures with ethmoid-orbital fractures can cause damage to the nasolacrimal drainage system and the medial canthal ligament. In some of these fractures, the medial canthal tendon is injured, resulting in traumatic telecanthus. A clinical finding associated with such detachment or severance of the medial canthal tendon is loss of the angular shape of the canthus, thus appearing rounded as a result of the lateral pull of the orbicularis oculi muscle. Also, the laterally displaced tissues of the upper and lower eyelids may cover the caruncle, the semilunar fold, and a portion of the sclera. Damage to the lacrimal drainage apparatus may present as epiphora or chronic infection secondary to nasolacrimal duct obstruction. Any portion of the lacrimal excretory apparatus, including the canaliculi, the lacrimal sac, or the nasolacrimal duct, may be obstructed by compression from displaced bone fragments or severed by similar fragments. Another presentation of a medial wall fracture is enophthalmos, which results from the prolapse of tissue from the orbital cavity or enlargement of the cavity itself. In later stages, it may be caused by contracting necrotic muscles, orbital fat atrophy, or cicatricial contraction of the retrobulbar tissues. Fractures of the medial orbital wall may cause little, if any, symptomatology. Operative treatment is not necessary if a displaced medial wall fracture shows no clinical diplopia, minimal enophthalmos, and no signs of herniation of orbital contents into the ethmoid sinus. A good functional and cosmetic result can be expected in this situation. On the other hand, if the fracture causes symptomatic horizontal diplopia within 25-30° of primary gaze or painful ocular motility, a positive forced duction test, and evidence of muscle entrapment on CT scan, repair of the fracture with release of the incarcerated tissue is warranted within 2 weeks of the injury. Within this period, the surgery becomes technically easier and more successful, especially because fibrous or osseous union has not progressed sufficiently to immobilize the fragments. In addition, incarceration of tissues may lead to necrosis and deformity if not relieved soon after the injury. This compartment-type occurrence with ischemia of entrapped soft tissue (intraorbital fat or muscle) is frequently encountered in the trapdoor fractures that occur in the pediatric population. Therefore, in these patients, even earlier surgery, within the first 48-72 hours  after the injury, is warranted to prevent any fibrosis of the muscular and perimuscular tissue, thereby restoring optimal muscle function. Early enophthalmos of 2 mm or more, which may be cosmetically unacceptable to the patient, is also an indication for repair of an isolated medial wall fracture. However, it should be noted that if an isolated medial wall fracture causes enophthalmos only, it may be advisable to wait until the fracture has healed and then put material on the floor to repair the enophthalmos. Displacement of bone fragments toward the globe or optic nerve merits surgical intervention and reduction as soon as possible. Both severe orbital emphysema and large intraorbital hemorrhage that cause acute loss of vision are indications for immediate exploration and possible orbital decompression. Repair of a concomitant orbital floor fracture may be an indication for repair of the medial wall. A basic knowledge of the anatomy of the medial orbital region is necessary, first, to understand the complications that arise from fractures of this area and, second, to perform surgical intervention when it is required. The 4 bones that make up the medial wall (anteriorly to posteriorly) are the frontal process of the maxilla, the lacrimal bone, the orbital plate of the ethmoid, and finally the lesser wing of the sphenoid, through which the optic nerve traverses in the optic canal. The rectangular lamina papyracea of the ethmoid, which has a convex orientation with respect to the orbital cavity, is the largest component of the medial orbital wall. It is extremely thin, varying 0.2-0.4 mm in thickness. The thick frontal process of the maxilla forms the medial orbital rim. When operating in the medial area of the orbit, surgical landmarks that must be kept in mind are the medial canthal tendon, lacrimal sac, the area of the trochlea, and the anterior ethmoidal vessels. The fragile lacrimal bone and the frontal process of the maxilla form the lacrimal groove (or fossa), which houses the lacrimal sac. The trochlea is attached to the periorbita in the anterior portion of the superior medial orbit. The ethmoidal foramina, which are about 24 mm and 36 mm behind the orbital rim, respectively, transmit the anterior and posterior ethmoidal arteries. All these vessels can be significant sources of bleeding when the region is involved in trauma, but only the anterior ethmoidal vessels need to be avoided during surgery. The lacrimal sac is intimately related to the medial canthal tendon, which is a major supporting structure of the superficial tissues of the medial orbital region. The tendon splits into 2 heads. The anterior head lies anterior to the lacrimal sac and inserts into the anterior lacrimal crest, which is formed by the frontal process of the maxilla; the posterior head courses posterior to the sac and attaches to the posterior lacrimal crest. Small medial wall fractures that cause no clinical symptoms or signs do not need surgical repair. Such fractures heal on their own in approximately 3 weeks without any sequelae. Another contraindication to repair of the fracture would be a concurrent ruptured globe, which would need to be repaired prior to any orbital surgery. Finally, in patients with other life-threatening medical problems or severe neurologic damage from head trauma, repair of the medial wall fracture would not be indicated. de Silva DJ, Rose GE. Orbital blowout fractures and race. Ophthalmology. 2011 Aug. 118(8):1677-80. [Medline]. Burm JS, Chung CH, Oh SJ. Pure orbital blowout fracture: new concepts and importance of medial orbital blowout fracture. Plast Reconstr Surg. 1999 Jun. 103(7):1839-49. [Medline]. Brannan PA, Kersten RC, Kulwin DR. Isolated medial orbital wall fractures with medial rectus muscle incarceration. Ophthal Plast Reconstr Surg. 2006 May-Jun. 22(3):178-83. [Medline]. de Visscher JG, van der Wal KG. Medial orbital wall fracture with enophthalmos. J Craniomaxillofac Surg. 1988 Feb. 16(2):55-9. [Medline]. Gerard M, Merle H, Domenjod M, et al. [Isolated blow out fracture of the medial wall of the orbit with medial rectus entrapment. Apropos of 3 cases]. J Fr Ophtalmol. 1996. 19(10):591-6. [Medline]. McCulley TJ, Yip CC, Kersten RC, et al. Medial rectus muscle incarceration in pediatric medial orbital wall trapdoor fractures. Eur J Ophthalmol. 2004 Jul-Aug. 14(4):330-3. [Medline]. Hatton MP, Watkins LM, Rubin PA. Orbital fractures in children. Ophthal Plast Reconstr Surg. 2001 May. 17(3):174-9. [Medline]. Jordan DR, Allen LH, White J. Intervention within days for some orbital floor fractures: the white-eyed blowout. Ophthal Plast Reconstr Surg. 1998 Nov. 14(6):379-90. [Medline]. Tse R, Allen L, Matic D. The white-eyed medial blowout fracture. Plast Reconstr Surg. 2007 Jan. 119(1):277-86. [Medline]. McInnes AW, Burnstine MA. 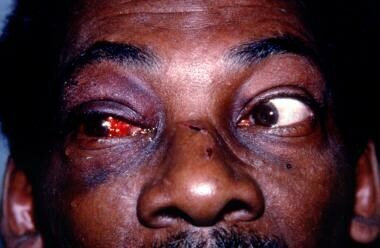 White-eyed medial wall orbital blowout fracture. Ophthal Plast Reconstr Surg. 2010 Jan-Feb. 26(1):44-6. [Medline]. McCulley TJ, Yip CC, Kersten RC, Kulwin DR. Medial rectus muscle incarceration in pediatric medial orbital wall trapdoor fractures. Eur J Ophthalmol. 2004 Jul-Aug. 14(4):330-3. [Medline]. Lane K, Penne RB, Bilyk JR. Evaluation and management of pediatric orbital fractures in a primary care setting. Orbit. 2007 Sep. 26(3):183-91. [Medline]. Kang MS, Jeong EC. 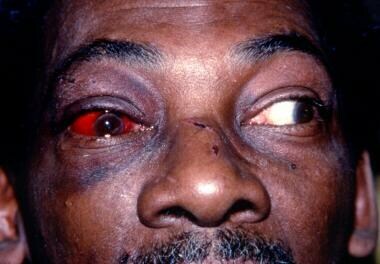 White-eyed medial orbital wall fracture with oculocardiac symptoms. Arch Plast Surg. 2015 Mar. 42 (2):247-9. [Medline]. Kim YH, Park Y, Chung KJ. Considerations for the Management of Medial Orbital Wall Blowout Fracture. Arch Plast Surg. 2016 May. 43 (3):229-36. [Medline]. Scolozzi P. Reconstruction of severe medial orbital wall fractures using titanium mesh plates placed using transcaruncular-transconjunctival approach: a successful combination of 2 techniques. J Oral Maxillofac Surg. 2011 May. 69(5):1415-20. [Medline]. Garcia GH, Goldberg RA, Shorr N. The transcaruncular approach in repair of orbital fractures: a retrospective study. J Craniomaxillofac Trauma. 1998 Spring. 4(1):7-12. [Medline]. Shorr N, Baylis HI, Goldberg RA, Perry JD. Transcaruncular approach to the medial orbit and orbital apex. Ophthalmology. 2000 Aug. 107(8):1459-63. [Medline]. Graham SM, Thomas RD, Carter KD, et al. The transcaruncular approach to the medial orbital wall. Laryngoscope. 2002 Jun. 112(6):986-9. [Medline]. Kim S, Helen Lew M, Chung SH. Repair of medial orbital wall fracture: transcaruncular approach. Orbit. 2005 Mar. 24(1):1-9. [Medline]. Nguyen DC, Shahzad F, Snyder-Warwick A, Patel KB, Woo AS. Transcaruncular Approach for Treatment of Medial Wall and Large Orbital Blowout Fractures. Craniomaxillofac Trauma Reconstr. 2016 Mar. 9 (1):46-54. [Medline]. Smith B, Grove A, Guibor P. Fractures of the orbit. Duane's Clinical Ophthalmology. Philadelphia, Pa: Lippincott-Raven; 1994. Vol 2: 1994. Kang N, Song SH, Kyung H, Oh SH. Medpor Implant Fixation Using Fibrin Glue in the Treatment of Medial Orbital Wall Fracture. J Craniofac Surg. 2015 Jun. 26 (4):1361-4. [Medline]. Chen CT, Chen YR, Tung TC, et al. Endoscopically assisted reconstruction of orbital medial wall fractures. Plast Reconstr Surg. 1999 Feb. 103(2):714-20; quiz 721. [Medline]. Lee MJ, Kang YS, Yang JY. Endoscopic transnasal approach for the treatment of medial orbital blow-out fracture: a technique for controlling the fractured wall with a balloon catheter and Merocel. Plast Reconstr Surg. 2002 Aug. 110(2):417-26; discussion 427-8. [Medline]. Arthurs B, Silverstone P, Della Rocca RC. Medial wall fractures. Adv Ophthalmic Plast Reconstr Surg. 1987. 6:393-401. [Medline]. Lee HM, Han SK, Chae SW. Endoscopic endonasal reconstruction of blowout fractures of the medial orbital walls. Plast Reconstr Surg. 2002 Mar. 109(3):872-6. [Medline]. Leone CR Jr, Lloyd WC 3rd, Rylander G. Surgical repair of medial wall fractures. Am J Ophthalmol. 1984 Mar. 97(3):349-56. [Medline]. Segrest DR, Dortzbach RK. Medial orbital wall fractures: complications and management. Ophthal Plast Reconstr Surg. 1989. 5(2):75-80. [Medline]. Smith B, Lisman RD, Simonton J. Volkmanns contracture of the extraocular muscles following blowout fracture. Plast Reconstr Surg. 1984 Aug. 74(2):200-16. [Medline]. Chung KJ, Lim JH, Kim TG, Lee JH, Kim YH. Correction of Medial Blowout Fractures According to the Fracture Types. Ann Plast Surg. 2016 Jan. 76 (1):46-50. [Medline]. Coronal CT scan of the orbits of a patient with an injury to his right orbit as a result of blunt trauma from a fist reveals a right medial orbital wall fracture with the medial rectus entrapped.